David Bowie died a year ago, but his impact in all areas of the arts is still being felt. 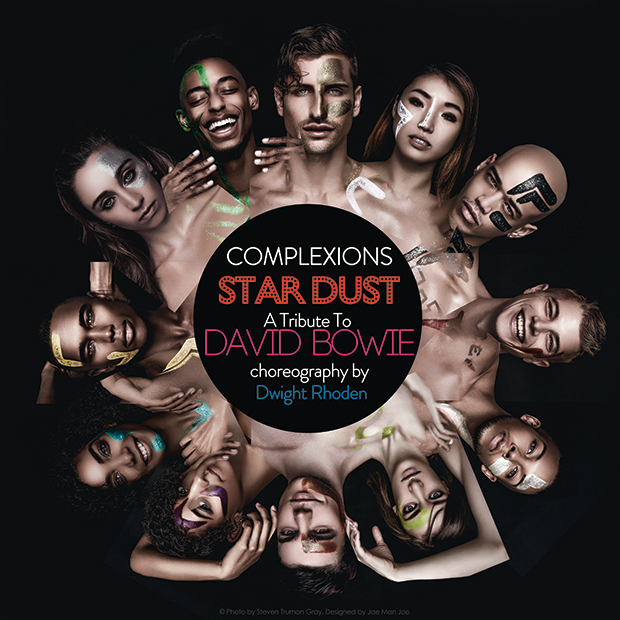 Just opened last week at the Brooklyn Museum of Art is the acclaimed exhibition David Bowie is, and here in Honolulu Ballet Hawaii presents New York–based company Complexions Contemporary Ballet performing Star Dust: A Tribute to David Bowie March 24, 7:30pm, at Blaisdell Concert Hall. Ballet Hawaii offers Honolulu Museum of Art enewsletter subscribers 20% off tickets (except $30 level). To receive your discount, click “buy now” and use the code VISUAL. Code is valid until Friday, March 9. Experience the brilliance of David Bowie in this production that features Bowie hits, such as Changes and Heroes, and glam rock-inspired costumes by Christine Darch. Star Dust is a powerful, moving visual imprint, inspired by Bowie’s seminal personas and restless artistic invention. “[Bowie] had a quirky sort of interesting way of moving his head and turning his eyes and even dancing…. And I tried to incorporate that into the shape of the choreography,” Complexions co-founder and master choreographer Dwight Rhoden told Newsweek. Founded in 1994 by former Alvin Ailey star dancers Rhoden and Desmond Richardson, Complexions’ foremost innovation is to remove barriers to creative expression, not reinforce them. This singular approach mixes methods, styles and cultures to create groundbreaking movement that embodies the company’s historical moment, while simultaneously building its future. Today, Complexions is one of the world’s most recognized and respected performing arts names. In the 23 years since its inception, the company has born witness to a world that is becoming more fluid, more changeable and more culturally interconnected than ever before—continuing its mission of bringing unity to the world, one dance at a time. Lesa Griffith, thanks a lot for the post.Really thank you! Much obliged.